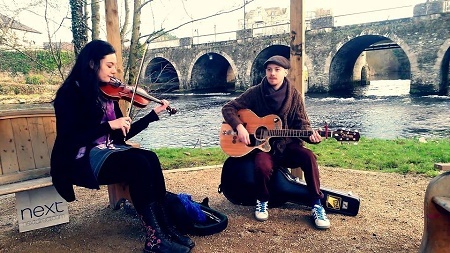 Duo comprising of Garry O’Brien and Grace Lambert. Specialise in Irish Traditional music as well as cover chart, classic hits and popular music. Their experience together began summer 2014 in the Temple Bar area entertaining tourists and locals and have been in demand for bigger and better shows ever since. The Dubliners, The Waterboys, Stevie Wonder, Pink Floyd, Paolo Nutini, Sam Smith, The Lumineers, Jason Mraz, Amy Winehouse, Mumford and Sons, Aslan, Christy Moore, Passanger, Jigs and Reels, Bob Marley. Setanta Sports Centre Ballymun, Gogarty’s,The Auld Dubliner, O’Sullivans, The Old Storehouse, Temple Bar, Buskers, Boyles Of Slane, Axis Theater. Instruments played: Takamine G series, TravelLog tomp box, Digitec Vox Harmony pedal, Luthier violin.